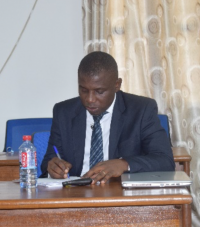 Ishmael Lente, from the University of Ghana, is the first PhD student with the Adaptation at Scale in Semi-Arid Regions (ASSAR) program to successfully defend his thesis, ‘Vulnerability and adaptation options to agroecosystems and climate change in semi-arid Ghana’. We asked Ishmael to tell us about his research, his experience with ASSAR, and what is next. Briefly, what is your research about? The study explores the patterns of vulnerability and adaptation strategies of smallholder farming households to recent changes in ecosystem services and climate in semi-arid Ghana. The study provides household-level primary data on the key climatic and non-climatic risks and adaptation strategies of smallholder households and significant drivers of adaptation strategies in the Nandom District in semi-arid Ghana. It also identifies ecosystem services that underpin the livelihood strategies of smallholder farmers in the local communities. The vulnerability analysis suggests that the adaptive capacities of the most vulnerable households were sensitive in terms of socio-demographic profiles, livelihood strategies and social networks. Vulnerability is seen to link mainly with household size, gender of household head, lack of education, lack of access to credit, and absence of social networks among other factors. Further, an analysis of 31-year rainfall and temperature records revealed high temporal rainfall variability and an increasing trend in temperature. How have START and ASSAR supported your research and your career growth? START facilitated the funding my research fieldwork through the Adaptation in Semi-Arid Regions (ASSAR) project. Further, START and ASSAR helped me to attain the requisite research skills for undertaking this PhD work. They provided the platform for training and skills development to be able to complete this work on time through various meetings and programs. For example, one important training program was the Climate Training Course held at the University of Cape Town, South Africa from the 26th August to 4th September, 2015. Additionally, through START, greater information on relevant research streams was shared for our benefit as students. What have you enjoyed the most during your work with ASSAR? The training sessions during the training program in Cape Town. This is because I had the opportunity to meet and interact with researchers from the various participating regions and did learn a lot that changed my world view about research, especially, social research. I am working to write and publish at least three professional papers from the PhD research work and to chase my dreams of pursuing an academic career. I also have plans to disseminate my research findings to the study district in order to assist them in improving adaptation strategies of households in the local communities through the lens of ecosystem services-based management. The Adaptation at Scale in Semi Arid Regions (ASSAR) project aims to improve understandings of barriers and enablers to climate change adaptation in semi-arid areas in Africa and Asia. START leads the West Africa team of ASSAR and plays a lead role in the overall capacity building efforts of the project, strengthening research and science communication skills with early-career researchers and creating capacity building opportunities for community members and other stakeholders in the regional research sites. The project is a collaboration with the University of Cape Town, the University of East Anglia, the Indian Institute for Human Settlements, and Oxfam Great Britain, and is supported by supported by Canada’s International Development Research Centre (IDRC) and the UK’s Department for International Development (DFID).